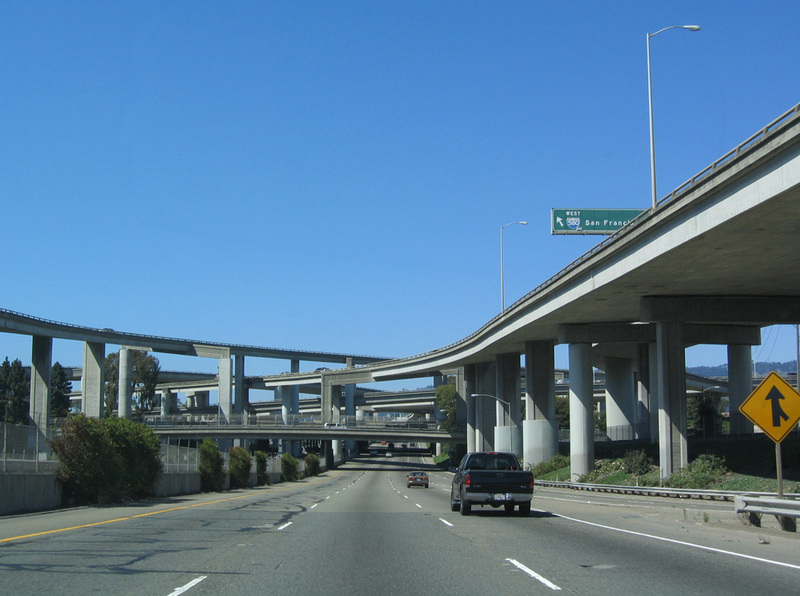 Traveling southwest through the four-level interchange linking SR 24, I-580 (MacArthur Freeway) and I-980 (Grove Shafter Freeway) in Oakland. Photo taken 07/18/09. 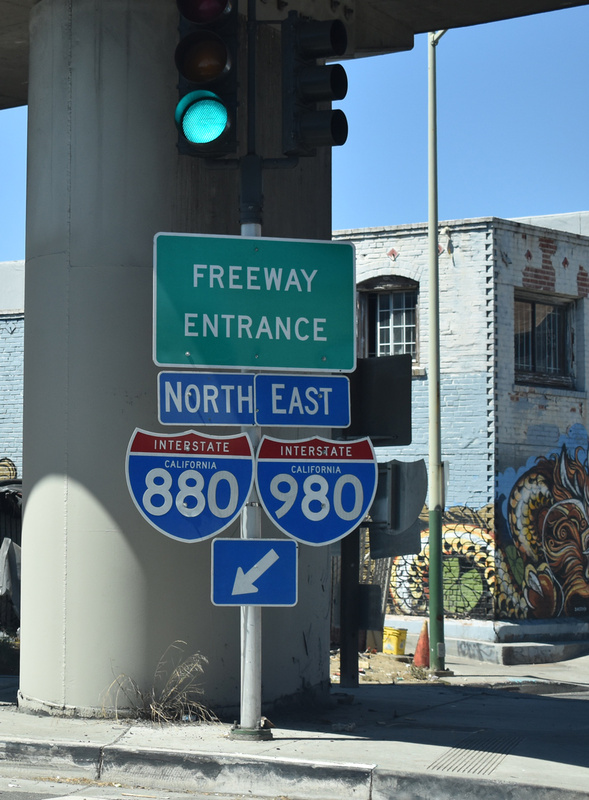 Interstate 980 is an urban freeway connecting I-880 (Nimitz Freeway) with California State Route 24 (Grove Shafter Freeway) in the city of Oakland. 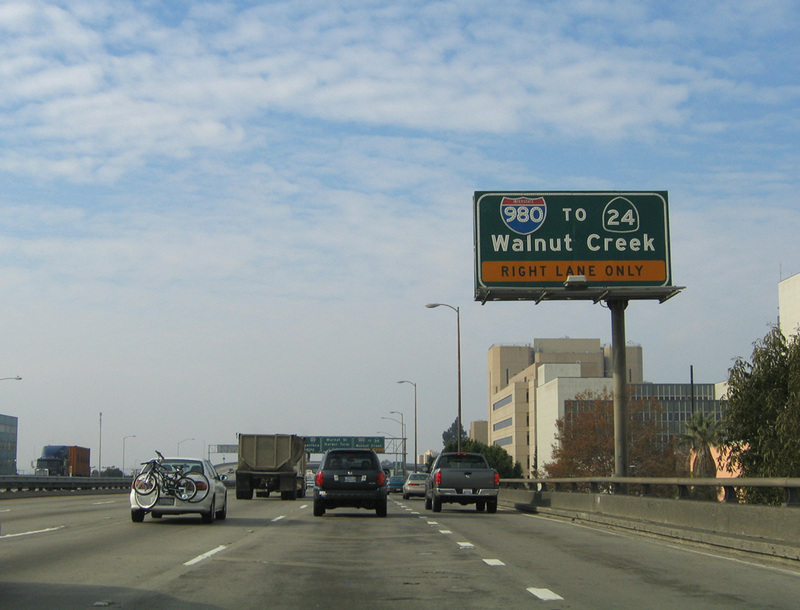 I-980 forms the western leg of a major commuter route joining the East Bay communities of Walnut Creek and Concord with Downtown Oakland and Oakland International Airport (OAK). 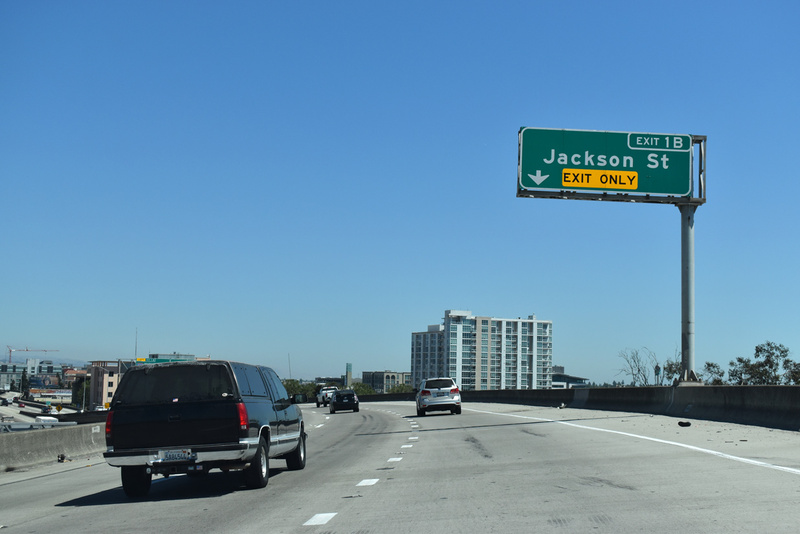 Sign replacements made in 2016 added exit numbers to eastbound off-ramps. 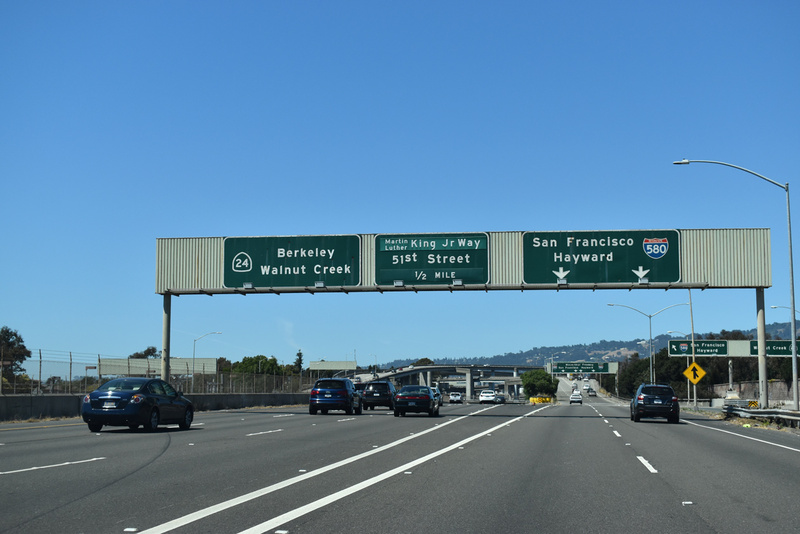 Confirming markers along Interstate 980 were installed by 2011. 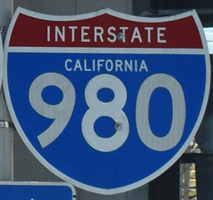 Interstate 980 served as a detour route for the northernmost portion of I-880 (Nimitz Freeway) between 1989 and 1999. Portions of the Cypress Structure, the double-decked section of the Nimitz Freeway (I-880), collapsed during the 1989 Loma Prieta Earthquake. 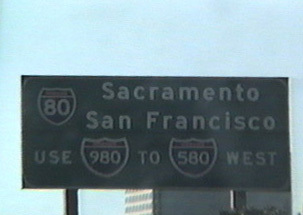 I-980 became the defacto route north to I-80 west across the San Francisco-Oakland Bay Bridge and I-80/580 north to Richmond. 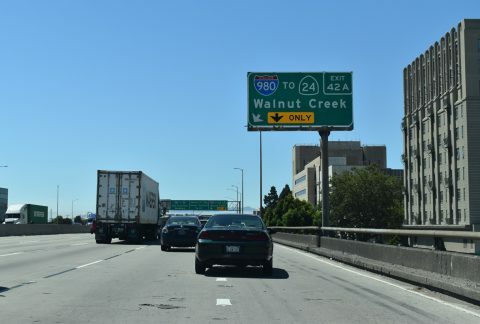 There are no plans to extend the Interstate 980 designation east or west. 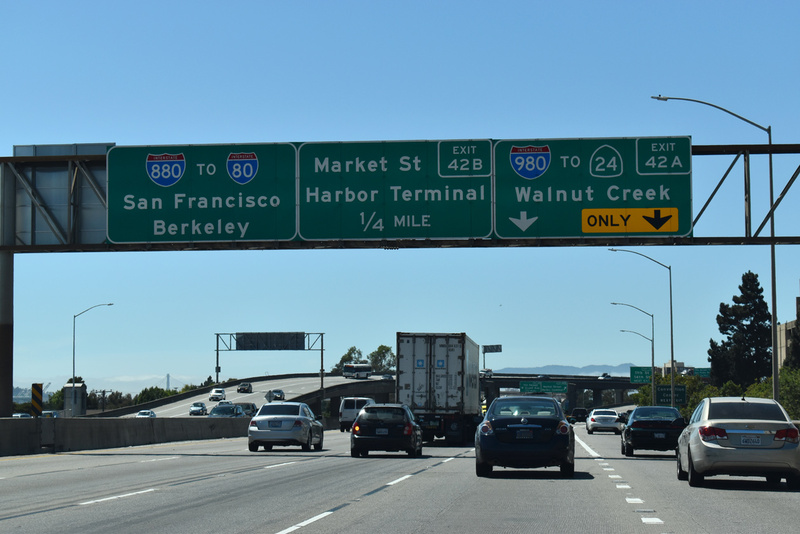 With the addition of the fourth bore for the Caldecott Tunnel, SR 24 is up to Interstate Standards east to Orinda and Walnut Creek. The fourth bore opened to traffic on November 16, 2013, expanding the freeway to eight overall lanes across the Berkeley Hills. Interstate 980 under construction as an extension of California 24 in 1971. Temporary guide sign used during the closure of the Nimitz Freeway north of I-980 following the 1989 Loma Prieta Earthquake. 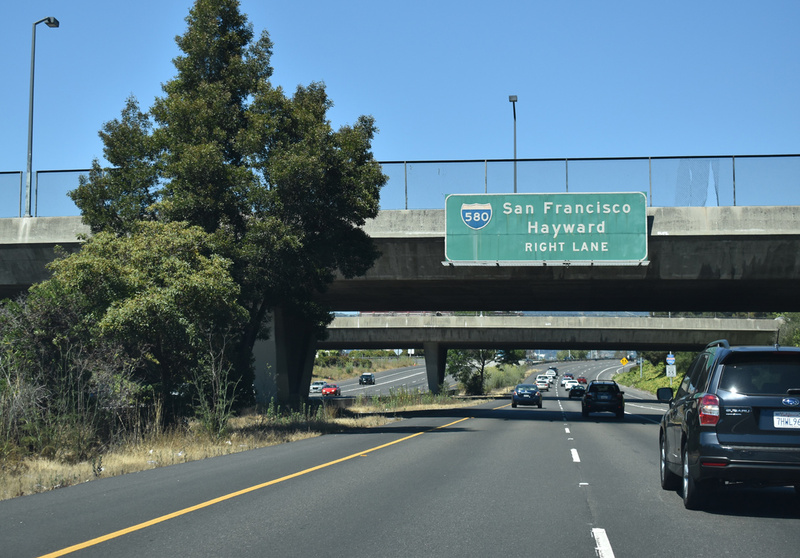 Interstate 980 travels below grade between Brush and Castro Streets before shifting eastward onto a viaduct over Grand and San Pablo Avenues. 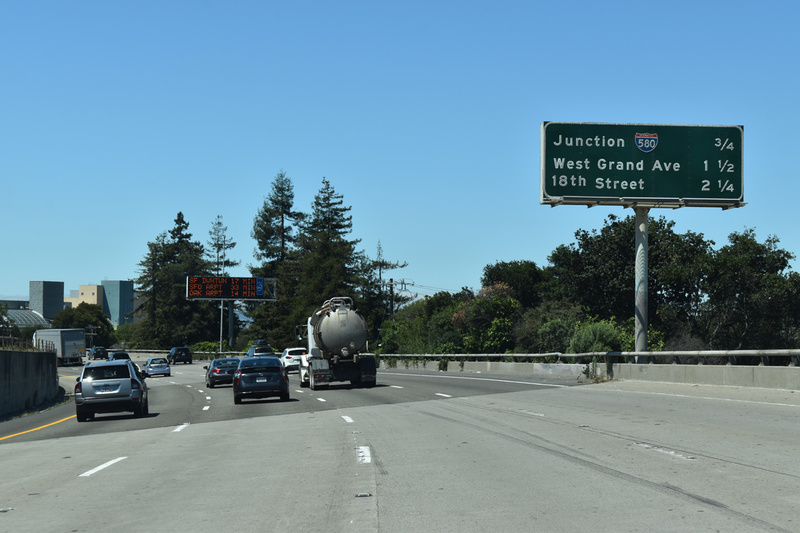 There are no additional local off-ramps to the multi level interchange with Interstate 580. Photo taken 07/11/18. 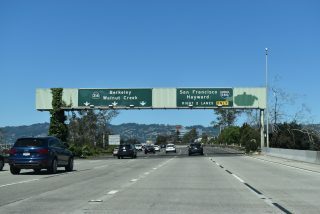 Crossing over Martin Luther King, Jr. Way, the Interstate 980 right of way widens to accommodate a BART line between the east and westbound lanes. The BART line extends northeast along SR 24 (Glen Shafter Freeway) to Patton Street. Photo taken 07/11/18. 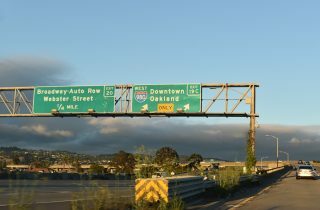 Exit 2 branches away from the I-980 / SR 24 eastbound mainline for Interstate 580 (MacArthur Freeway) west to the Maze Interchange with I-80 and southeast to San Leandro, Castro Valley and Hayward. Photo taken 07/11/18. Passing over 30th Street, I-980 / SR 24 east lower to pass below the I-580 mainline and associated flyovers connecting the two freeways. Interstate 580 travels overall northwest toward Richmond and Marin County and southeast toward Dublin and the Central Valley. Photo taken 07/11/18. California 24 continues with six then eight overall lanes from I-580 and I-980 to north Oakland and the Caldecott Tunnel. Photo taken 07/05/04. Crossing over Claremont Avenue and Hudson Street, one mile ahead of Interstate 580 (MacArthur Freeway) and I-980. Photo taken 07/11/18. Interchange sequence sign posted 0.75 miles ahead of I-580. 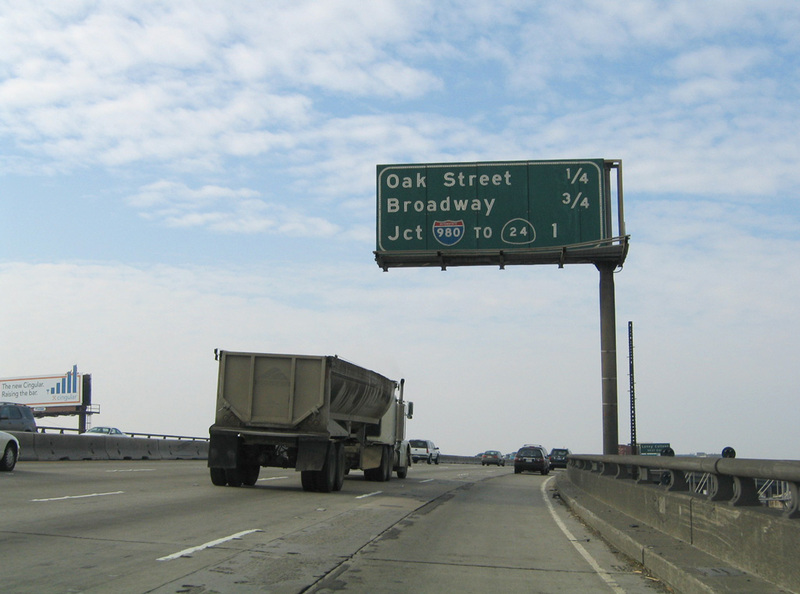 The succeeding exits are located along Interstate 980 west ahead of Downtown Oakland. Photo taken 07/11/18. 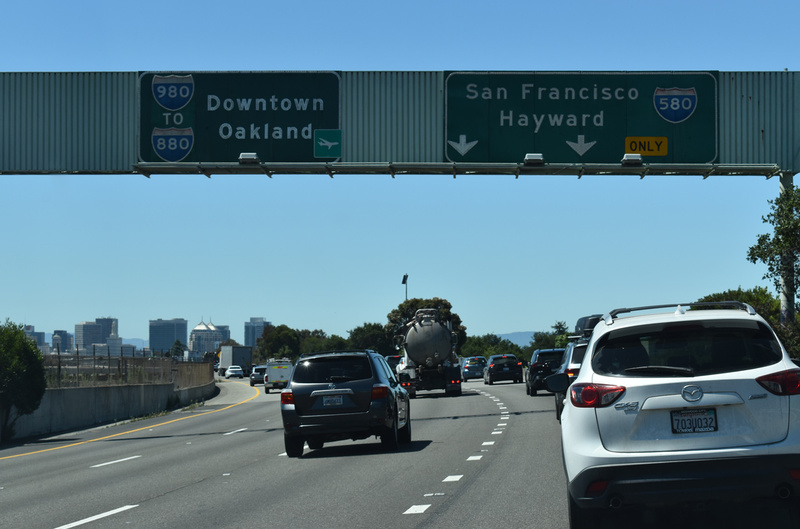 All traffic headed for I-580 west to the San Francisco-Oakland Bay Bridge or Richmond and I-580 east to Hayward departs from SR 24 west in unison for respective flyover ramps. 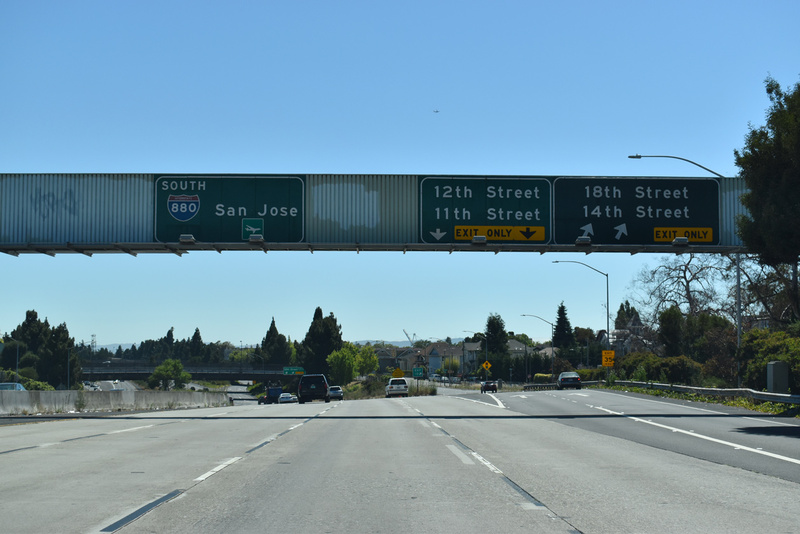 SR 24 transitions to I-980 otherwise. Photo taken 07/11/18. Entering the four level interchange with Interstate 580 (MacArthur Freeway) on SR 24 (Grove Shafter Freeway) west. 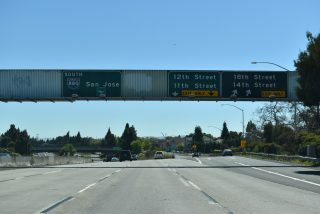 The off-ramp (Exit 2A) to 27th Street branches away from the Interstate 980 mainline within the exchange. Photo taken 07/11/18. 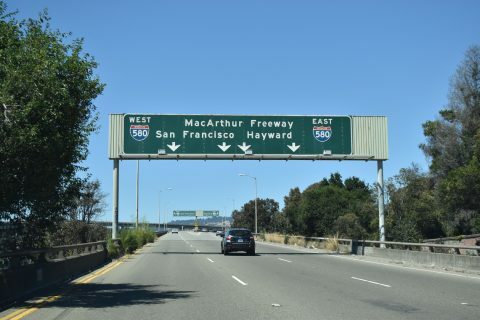 Leaving the MacArthur Maze interchange with I-880 (Nimitz Freeway) south and the San Francisco-Oakland Bay Bridge (I-80) west, Interstate 580 (MacArthur Freeway) advances 0.9 miles east from the wye with MacArthur Boulevard to I-980 west and SR 24 east. Photo taken 03/07/15. 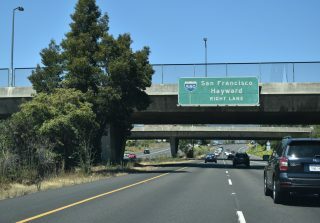 A high flyover connects I-580 (MacArthur Freeway) east with California 24 east across the Berkeley Hills. 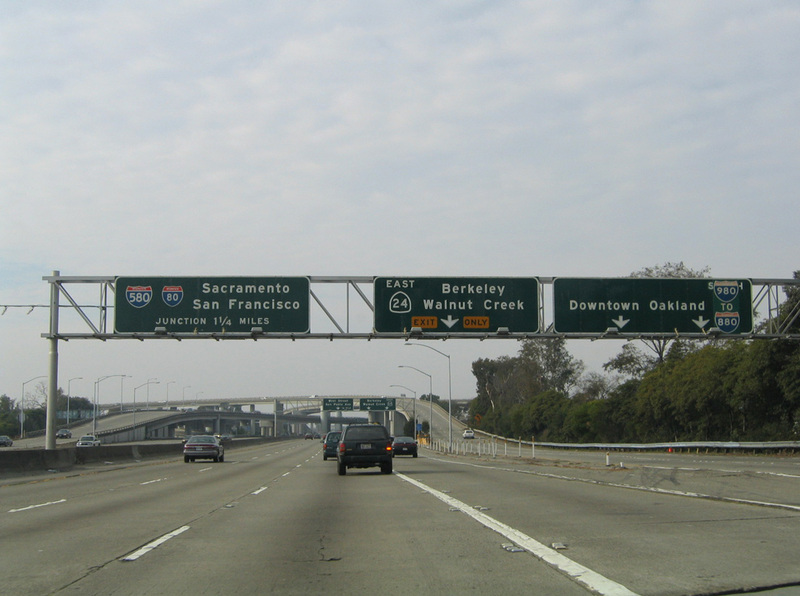 California 24 constitutes a busy commuter freeway from I-980 in Oakland and Berkeley to the East Bay cities of Lafayette, Walnut Creek and Concord. Photo taken 03/07/15. 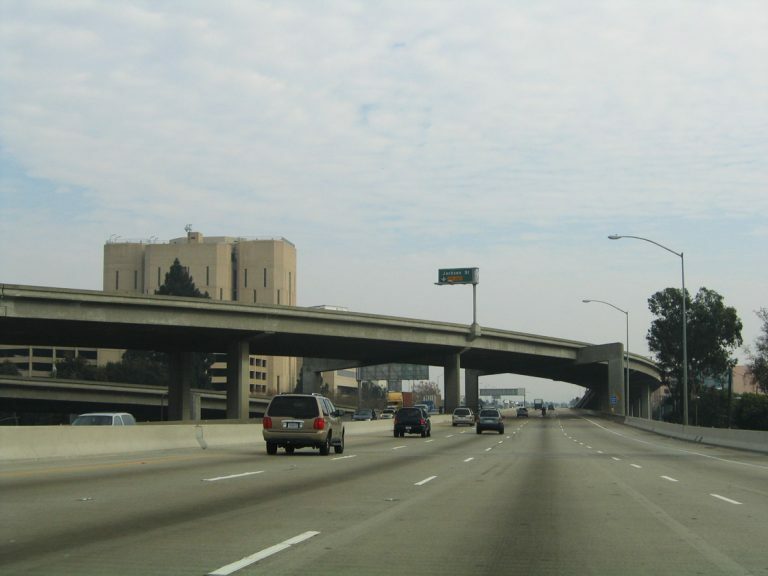 A two-lane flyover follows for Interstate 980 west to Downtown Oakland and I-880 (Nimitz Freeway) near Alameda. Photo taken 07/02/13. 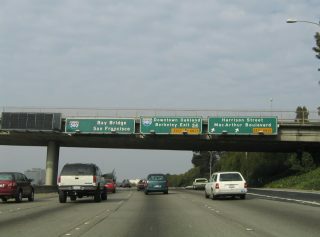 The first signs for I-980 and SR 24 along I-580 (MacArthur Freeway) westbound appear at the Adams Street overpass. 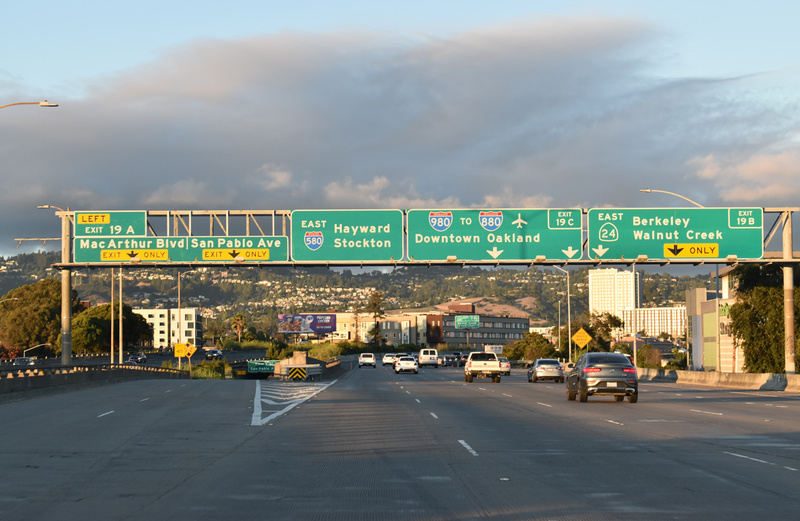 The freeway mainline advances with three lanes to the Maze Interchange, where it converges with I-880 north and I-80 near the eastern approach to the San Francisco-Oakland Bay Bridge. These overheads were replaced in 2016. Photo taken 11/26/04. 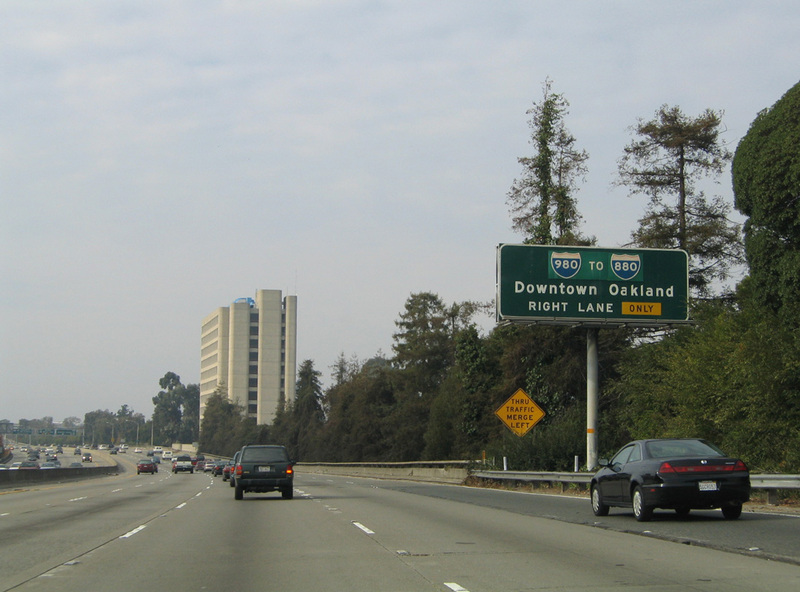 Interstate 980 links I-580 with Downtown Oakland. 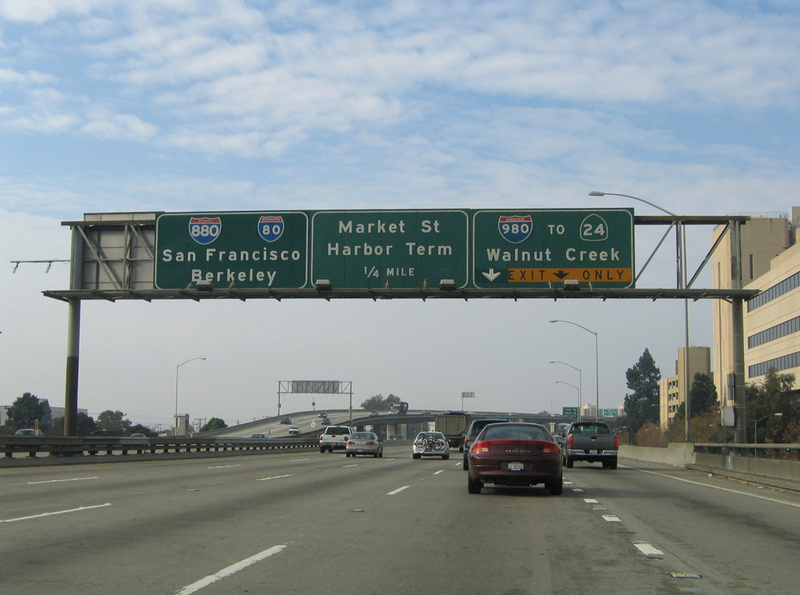 The connection with I-880 is limited to the Nimitz Freeway southbound. 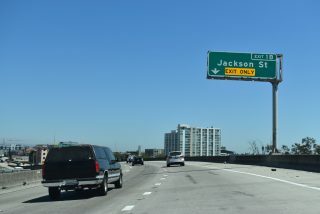 A replacement sign posted here in 2016 acknowledges the forthcoming exchange at Exit 19D. Photo taken 11/26/04. Westbound Interstate 580 (MacArthur Freeway) reaches Exit 19D for I-980 west to I-880 south for Oakland International Airport (OAK). 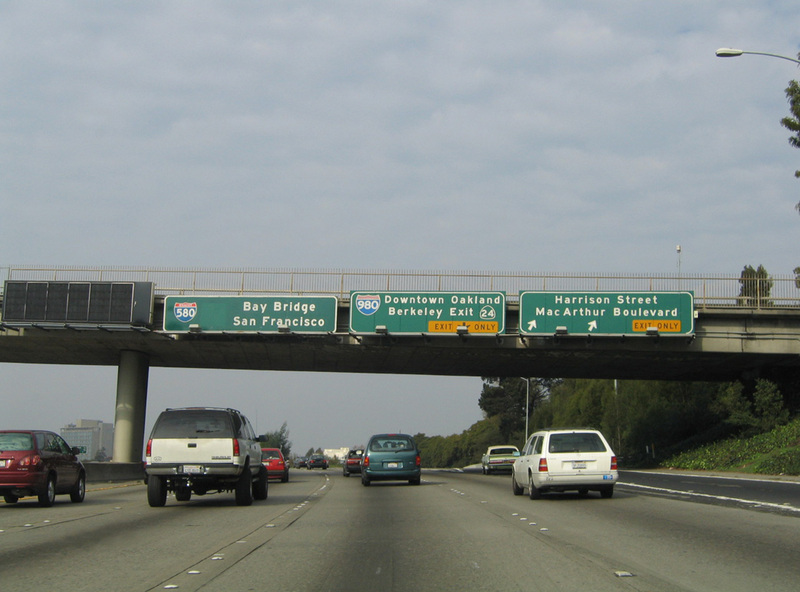 The succeeding off-ramp connects with SR 24 east to Berkeley and Contra Costa County. Photo taken 11/26/04. 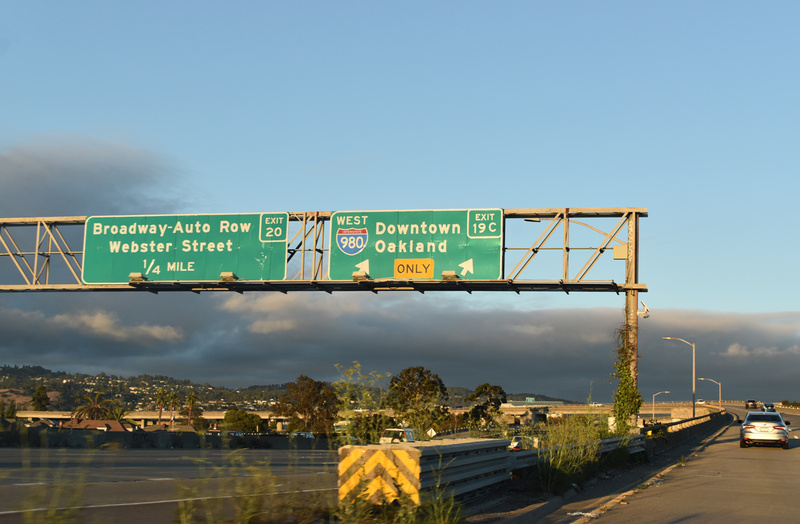 Back to back off-ramps connect Interstate 980 west with parallel Brush Street for the numbered street grid at Downtown Oakland. 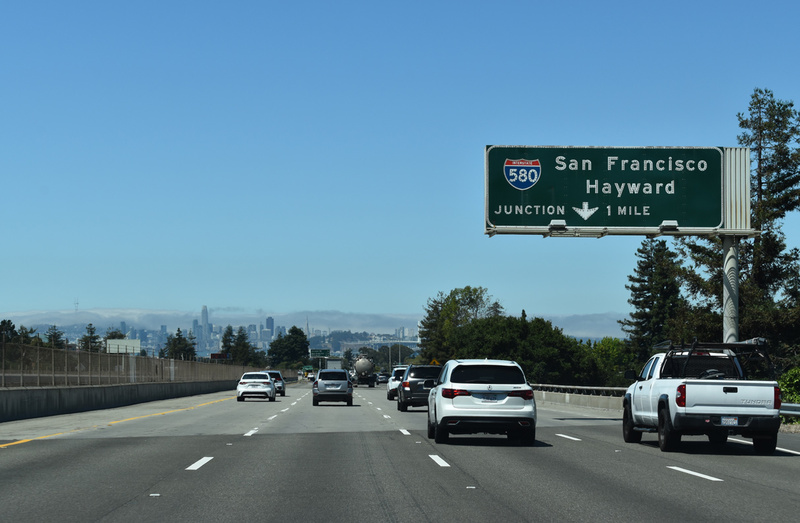 The freeway drops below grade on the approach to Interstate 880 south. Photo taken 07/11/18. Interstate 980 makes a sweeping curve to the south from 11th Street to merge with Interstate 880 (Nimitz Freeway) south beyond the Jackson Street off-ramp. Photo taken 07/11/18. 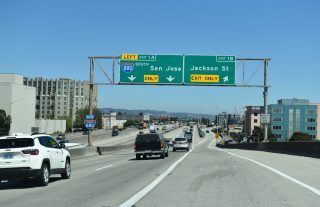 The three lane flyover carrying Interstate 980 west onto I-880 south separates with two lanes joining the Nimitz Freeway south toward San Jose (Exit 1A) and a lengthy off-ramp (Exit 1B) to 5th Street ahead of Jackson Street and Alameda. Photo taken 07/11/18. 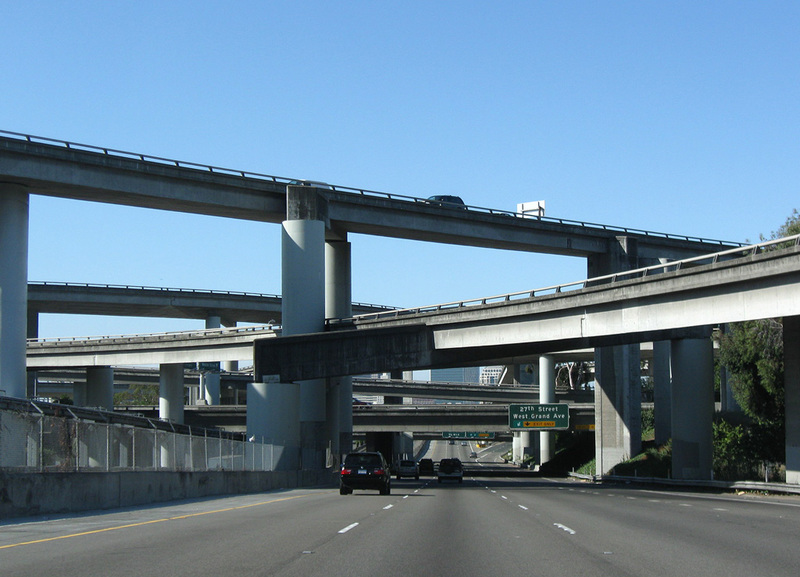 Interstate 980 west defaults onto I-880 (Nimitz Freeway) south at a wye interchange. 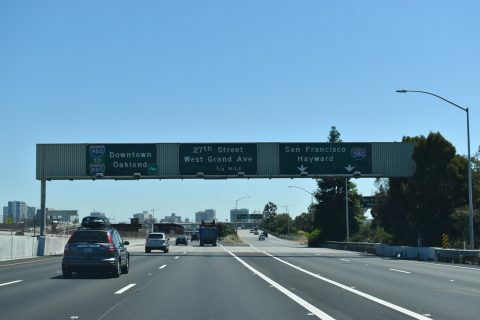 A lengthy Breezewood style connection can be made to access I-980 east via Union, 7th and Castro Streets. Photo taken 11/26/04. The entrance ramp from Jackson Street to I-880 adds an auxiliary lane north to Interstate 980 east (Exit 24A). Photo taken 07/11/18. 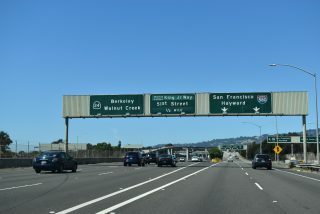 Northbound Interstate 880 (Nimitz Freeway) reaches the wye interchange (Exit 24A) for I-980 east to SR 24 (Grove Shafter Freeway) to Walnut Creek. Photo taken 07/11/18. 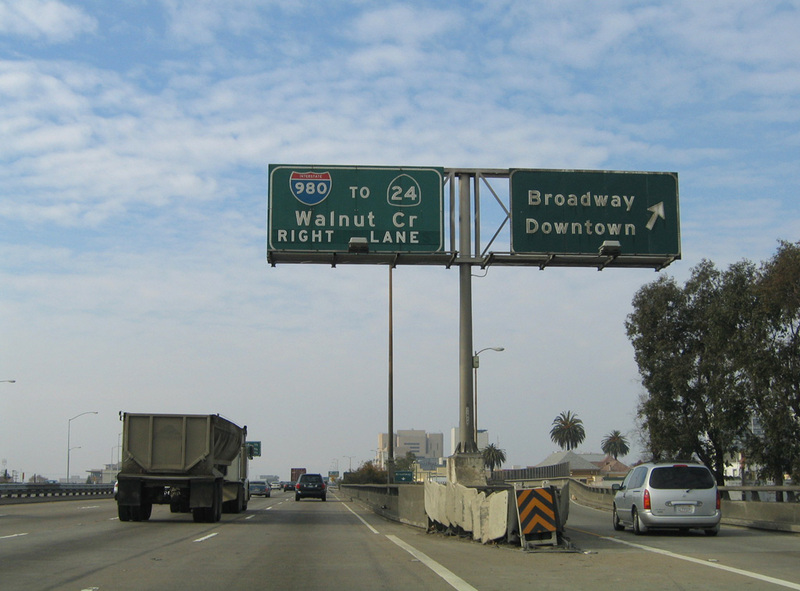 Reconstruction of the I-880 viaduct over 5th Avenue and the Union Pacific Railroad in 2011/12 included replacement of this interchange sequence sign one mile south of Interstate 980. Photo taken 11/26/04. 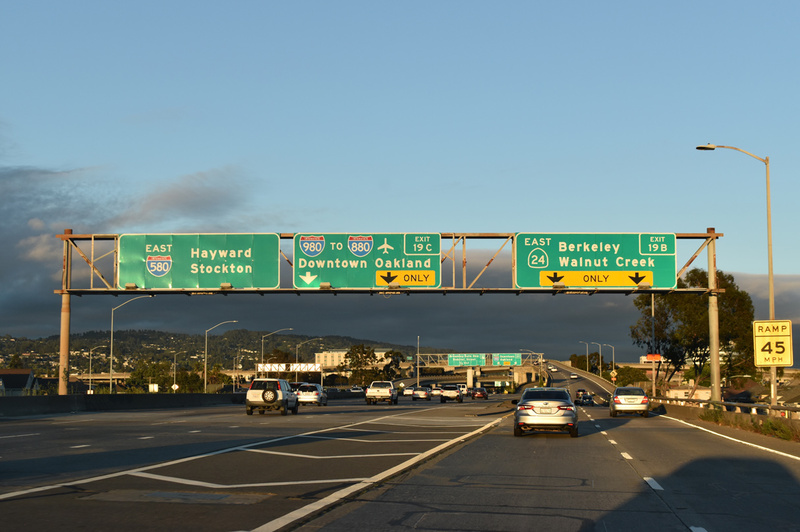 2017 sign replacements from Exit 41B northward to I-980 carbon copied the design of the previous button copy signs for both the Broadway off-ramp and I-980. Photos taken 11/26/04. 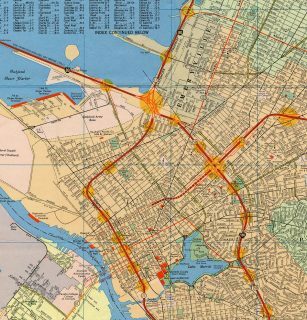 Eisenhower Interstate Highway System, Previous Facts of the Day. 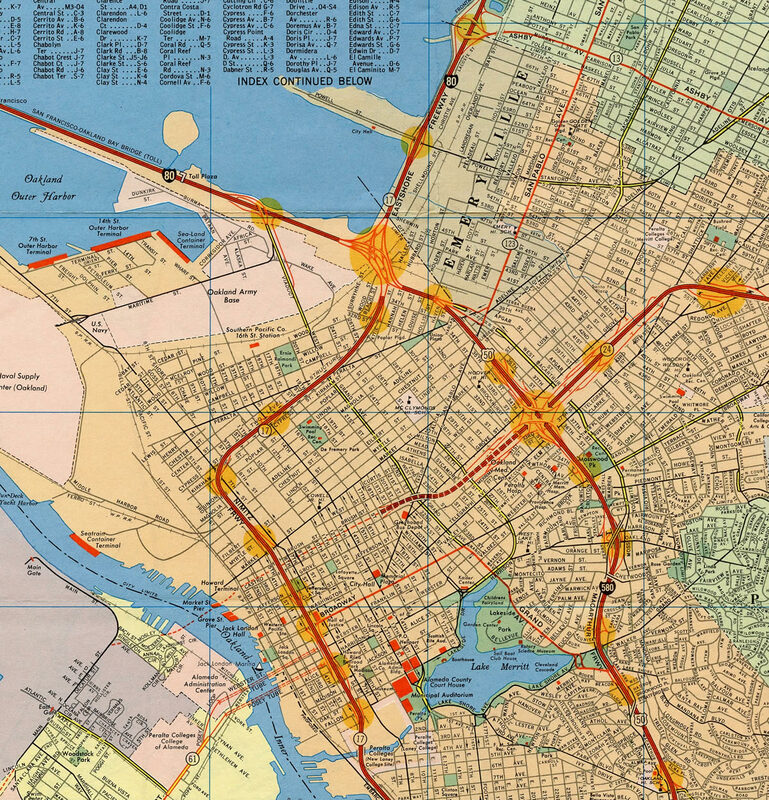 Federal Highway Administration (FHWA). Page updated March 7, 2019.